So you are a bride who wants a simple wedding dress. 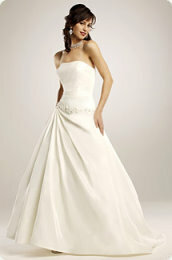 You want a wedding dress without any beading or one with very little trim and uncomplicated style lines. The simpler . . . the better you say. But you noticed it is hard to find wedding gowns without beading, lace or embellishment. What can you do? Search the web for simple wedding dresses. Look at the wedding gown designers lines to find those who tend to design styles with minimum embellishment. Look in the bridal magazines. If you notice a wedding dress designer who tends to design simple wedding gowns then go to their web site to see what other designs they may have. Check the local bridal shops. Ask the sales staff to help you find something with minimal beading and embellishment. Now the may not have anything in the shop but they may be able to show you a catalog of dresses from which you can order from. While in the bridal shop notice whether there are any wedding gowns where the trim can easily be removed. Laces and beaded trim can some times be removed without leaving an impression. Just removing a little trim can make a difference! Try looking for a secondhand wedding dress at a consignment shop, eBay and secondhand shop. Your relatives and friends might have something or know someone who has a bridal gown that might be a simple wedding gown or could be easily modified into one. If you locate a picture of a wedding dress or actually find one that you think can be modified by removing the embellishment, contact a wedding dress seamstress to see what is possible. It is best to contact the seamstress before purchasing the gown. Ask a wedding dress maker to make a custom wedding gown for you. Sometimes this is the best solution if you have a specific wedding dress design in mind. Have it made by an online design your own wedding dress company. Most major wedding dress designers have a few simple wedding gowns in their collection. I happen to notice that some of the wedding gown designers below had styles that were simple sophisticated wedding gowns. "The perfect simple bridal dress for you is out there!" "It will just take a little time on your part to discover it." Wedding Dress Tips: But there is something you need to be aware of when planning to wear a simple bridal gown. Sometimes I have had to add embellishment to a simple dress. Why? Well in some cases the bride wanted to add a little sparkle to her dress. But in some cases... the bride was kind of forced to put more on the dress. What happened to cause this? In each case the bride was being upstaged by her mother, the grooms mother and/or the bridesmaids. This wasn't done to the bride on purpose. But it happened in each case, because the bride failed to do something beforehand. What was that? Find out how not to be upstaged at your wedding when you wear a simple wedding dress. "Don't let this happen to you!"